During the early 18th Century, more than one third of the UK labour force worked in agriculture. British farmers were able to produce enough food to feed the whole population, and there was even surplus grain for exports. However, the repeal of the Corn Laws in 1846, and the effects this had during the First World War, had a massive impact on British farming and taught us valuable lessons for WW2. Ministry of Food Ration Book, 1918. Manchester Archives GB127.M138/2481. The Corn Laws were first introduced in Britain in 1815, when the landowners, who dominated Parliament, sought to protect their profits by imposing tariffs on cheap foreign imports of grain. This resulted in the artificial inflation of bread prices and meant that many British people struggled to afford this staple food item. The government faced fierce opposition in the form of the Anti- Corn Law League who campaigned to have the Corn Law abolished. However, it wasn’t until the devastating potato blight hit Europe in the 1840s that the Prime Minister, Sir Robert Peel, began to question the rationality of the Corn Law. 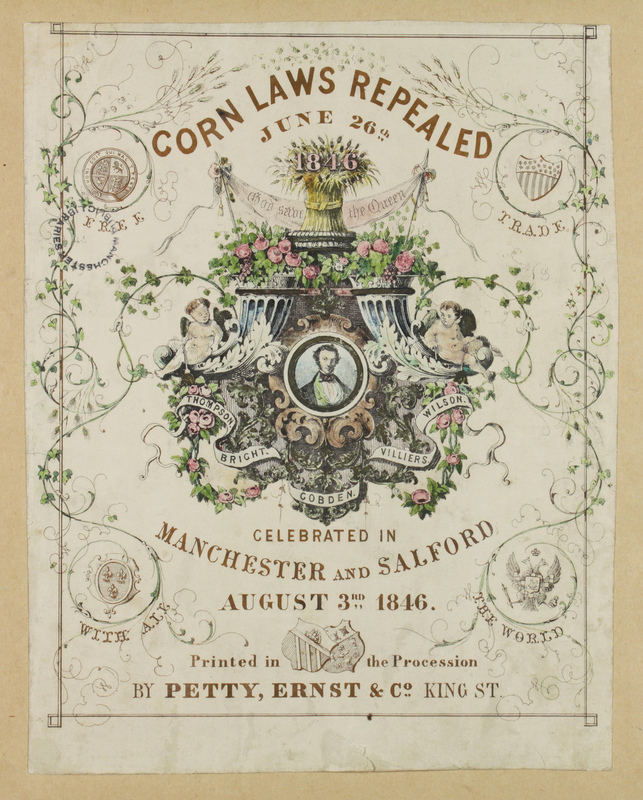 Broadside celebrating the Repeal of the Corn Laws, 3 Aug 1846. Manchester Archives GB127.Broadsides/F1846.3. In January 1846 a new Corn Law was passed that reduced the duty on imported oats, barley and wheat. Imports began to rise rapidly and Britain became more and more dependent on foreign deliveries of food, and, in particular, cereals. Many men from the farming industry were leaving to join the armed services leaving the country in even shorter supply of agricultural workers. In addition, severe weather in 1916 led to a poor wheat harvest and the failure of potato crops in Scotland and parts of England. The situation became even worse as supply routes became either completely cut off or increasingly treacherous. Merchant ships became targeted by German U-boats from 1916. By 1917 Germany declared unrestricted warfare and sank one in four merchant ships in the Atlantic. When David Lloyd George took over as Prime Minister in December 1916 he committed to dealing with the ‘food problem’. Bills were passed under the Defence of the Realm Act (DORA) to prevent food wastage and the price of foods such as milk and bread were fixed by the government. 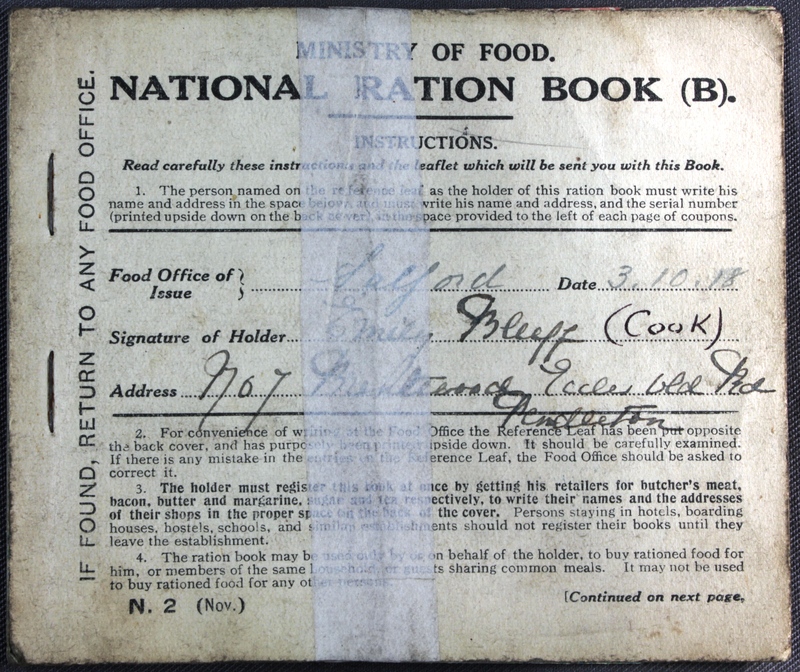 Compulsory rationing was also introduced, and citizens were encouraged to cut down on wheat usage and instead use alternatives such as potatoes. 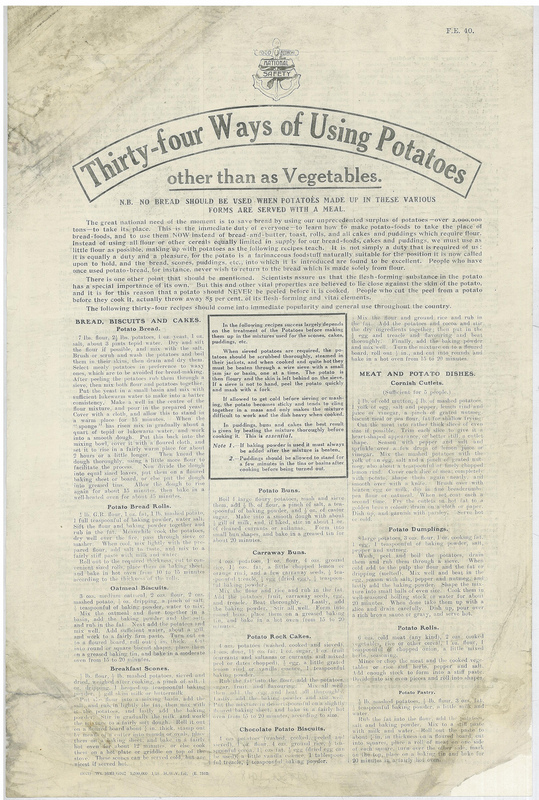 Ministry of Food Leaflet, 1918, encouraging the use of potatoes as a substitue for bread and flour. Manchester Archives GB124.Q330. The government were also able to seize control of any unused land for the use of farming under DORA. However, replacing lost labour proved more difficult as many of the men working on farms had enlisted. With two million acres of agricultural production needed, the government began a campaign to recruit as many female hands as possible. Thousands of women picked up ploughs, hoes and milk pails and joined the Women’s Land Army. Thanks to the work of British farmers and growers the country avoided being starved into surrender. The First World War changed the face of British farming and food production forever. The lessons learned by farmers, growers, policy makers and society continue to influence the decision making process in the 21st century.